Acoustical gasketing is installed to effectively block sound. But sound waves can travel through any opening with very little loss. While the amount of air flowing through a gap increases in proportion with the size of the gap, sound transmission is not affected by the size of the gap. Even a tiny hole transmits almost as much sound as a larger gap. This means unsealed gaps and clearances in door assemblies will effectively negate any noise reduction benefits of sound doors. For example, one-eighth-inch clearances around the edges reduce the effective rating of an STC-52 door to 21, resulting in very poor acoustical performance and a great deal of dissatisfaction. The performance loss is especially serious at medium to high frequencies. To ensure fool-proof installation of acoustical gasketing, the seals around the head, jamb and sill must be complete, uninterrupted and airtight throughout the service life of the door. All the gasketing must be installed on the same side of the door and frame for uninterrupted contact, and good surface contact between the gasket and door edge or frame can be facilitated using compression seals. 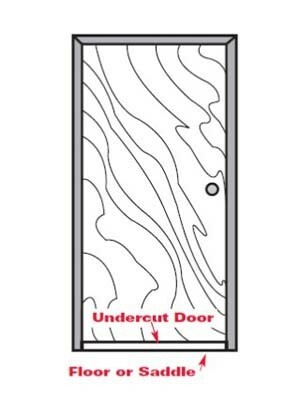 A common problem in newly installed gasketing comes from gaps caused by imperfect door alignment, which can surface later on as buildings shift and settle and doors cycle through changes in temperature and humidity. To ensure consistent performance over time, acoustical gasketing can be designed with adjustable features to restore a sound-tight seal when clearances increase for any reason. A key factor responsible for a high STC rating is the mass of the sealing material used in acoustical gasketing. While combining complementary materials can also provide better performance, another solution is to use air trapped in a sound lock between a pair of doors, or between layered sets of seals in a gasket, to create an excellent sound absorber. At the end of the day, the quality of the acoustical gasketing influences the acoustical performance, overcoming any installation deficiencies and determining how close the actual sound performance of an assembly will come to the published rating of the door. Improving the quality of the gasketing brings the STC value of the functioning opening closer to its theoretical maximum. While door openings rated in the STC 30 to STC 40 range are common, achieving STC 50 and higher ratings is extraordinarily difficult.